Clay Modelling workshops 10am - 4pm on Saturday 26th and Sunday 27th of January 2019. Sculptor Kenny Hunter will lead this 2 day course in figurative clay modelling at Powderhall Bronze Art Studio in January. There will be an introductory Artists Talk followed by 2 days of clay modelling workshops when each student will build a clay sculpture. 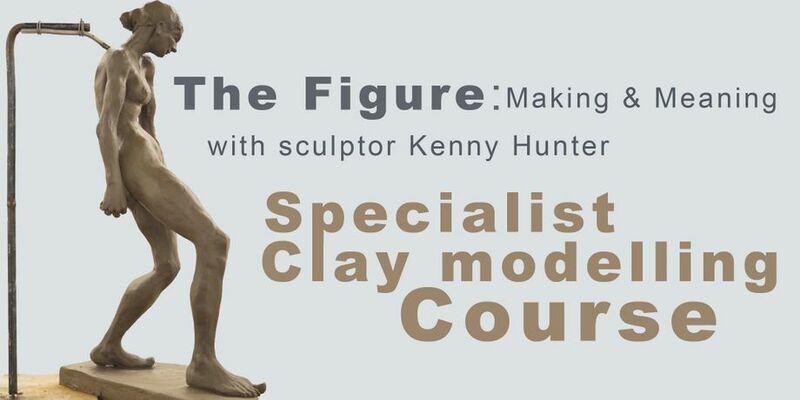 Kenny will be leading a fourth course on the narrative possibilities of the Figure in Sculpture at Powderhall Bronze in January 2019. Following on from the last course in September this will again be an opportunity to develop your technical ability in clay modelling and creative thinking about figurative sculpture. Developing on from his last talk Kenny will discuss new approaches to working with the figure in sculpture. The talk will be followed by conversation with refreshments when questions about making and process can be addressed. Students will be invited to do some research to decide upon a pose for their work and provide initial sketches / ideas prior to the weekend clay workshops. In discussion with Kenny and fellow students you will be encouraged to develop your own response to the figure and learn how meaning can be embedded in the artwork through subject, scale, surface and materials. The weekend will begin with a morning session assessing initial ideas followed by armature building. The rest of the weekend will taken up with the development of your work in clay with the support of the tutor. This is a complete course and all art materials will be provided. Places are limited to 10 and the course is open to beginners and experienced sculptors. We have a fully equipped and accessible tea room where lunch will be provided on Saturday and Sunday by Edinburgh's CAFE MILK http://www.cafemilk.co.uk/ Please let us know if you are Vegetarian, Vegan or have other dietary requirements as all diets can be catered for. There will be a 15% discount on any subsequent Foundry Casting Services for course students. Kenny Hunter exhibits his work worldwide and produces large scale monumental public sculpture. He is also a Lecturer in Sculpture at Edinburgh College of Art. Please follow the link below to book a place.